Whether in-person or online, customers demand personalized engagement that makes them more confident in their financial decisions. In exchange, customers will offer their loyalty. To build trust and increase customer lifetime value, bank marketers must go above and beyond customer expectations while avoiding common marketing pitfalls. In part one of our three-part series, Total Expert details how banks must define their customer personas and remove enterprise data silos to create personalized marketing and engagement that boosts customer loyalty. To attract and retain customers, you need to understand what makes your customers tick. Banks have mountains of customer data – from checking accounts to credit scores to demographics and need to leverage this information to define and understand their target customers. Blindly sending customers messaging that is neither relevant or helpful is a great way to lose trust and harm customer loyalty. And with so much data at your fingertips, banks must bring order to their data chaos. Personas help banks understand their customer on a deeper, more personal level, so they can respond to the needs of consumers in a way that feels natural and spontaneous, not canned or impersonal. The reward? Better business outcomes. For better customer personas, banks must focus on data that speaks to three key areas: financial literacy, engagement and preferences. Literacy – Banks must consider each consumer’s financial intelligence when marketing across their products and services. Messaging that requires deep knowledge on the part of the customer may fall on deaf ears. Once you’ve developed personas catered to levels of financial literacy, banks can better target customer messaging that educates and improves financial outcomes, building consumer trust. Engagement – Banks must craft personas that reflect a consumer’s overall engagement with your bank’s brand. Past behaviors – like page views or opening new accounts – typically correspond with life events and future intentions. By monitoring how consumers engage across the customer journey, banks can infer motivations and better personalize their outreach. Preferences – Banks should keep a close eye on the specific marketing elements their customers favor, including preferred channels, products and services, even time of contact. With these preferences in mind, you can fine-tune your personas to drive better results. For most banks, crafting persona marketing strategies should be a “walk-before-you-run” endeavor, as new data and content will force you to re-evaluate as you go. Focusing on how customer literacy, engagement and preferences shift will be a positive step towards personalizing the customer experience and avoiding this common pitfall. Another barrier for bank marketers is silos of customer data. Legacy systems and rogue solutions prevent banks from connecting all their customer information in one place and gaining the ever-elusive 360-degree view of the customer. Data silos act like vaults for your enterprise systems — and if each “vault” is walled off from the other, it’s nearly impossible to leverage the richness of all your customer information. 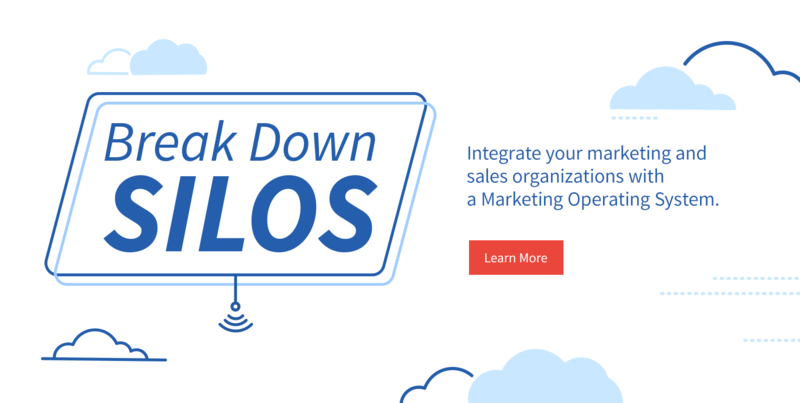 Banks that fail to remove data silos are missing out on greater ROI from their technology solutions and falling behind competitors that have integrated their sales and marketing organizations and tech stacks. Missed opportunities – Having an incomplete picture of your customer blinds you from otherwise profitable opportunities. Banks that have a clear view of their customers’ accounts, activity and life events are more capable of anticipating customer needs and meeting their rising expectations in the future. Poor customer experience – Disconnected data creates needless barriers between your customer and your services, such as missed preapprovals or out of place messaging. By connecting enterprise data (across all channels and all departments) banks can elevate their brand with data-driven outreach that is relevant and reduces friction. Lower Lifetime Value – Banks that lack a 360-degree view of their customers struggle to earn repeat business. That’s because customer value is highest across a lifetime of transactions — but, to build that lifetime loyalty, banks need data insights that anticipate customer needs and serve relevant messaging across life events. Leveraging your database (or “customer-base”) fully enables banks to become a central financial partner by helping their customers understand make better financial decisions in the future. To better serve customers, and to bolster marketing ROI, banks must improve customer personas and remove data silos to reduce friction across the customer journey. Modern consumers expect their financial institutions to use data to understand them better and deliver one-to-one messaging based on their current life events. Banks must appeal to this consumer preference to avoid these common marketing pitfalls. Watch for part two of our bank marketing pitfalls series soon on the Total Expert blog. Forbes Finance Council: Banks and Lenders: Is Your Customer Data Powering an Amazing Customer Experience?